The Series 98 Cover Crop Drill is designed to efficiently plant cover crop seeds in vineyards, orchards and open-field applications. The Schmeiser No-Till Drill is designed to tackle stubborn non cultivation ground. Heavy duty No-Till coulters are designed for severe conditions. Attaching to the main legume seed box of the Cover Crop Drill the Native Grass Seed Box is perfect for native grasses and wildflower seeds. The Schmeiser Small Seed Box is available for growers that want to plant small seeds. 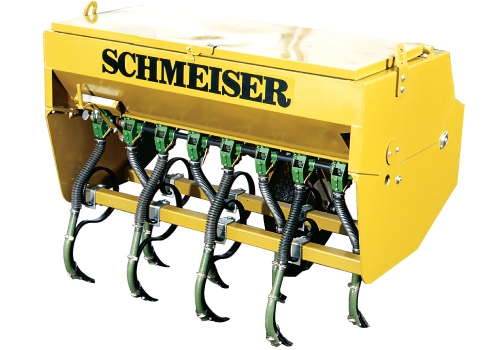 The Schmeiser S-Tine Seeder is the economical alternative to planting cover crop seed.